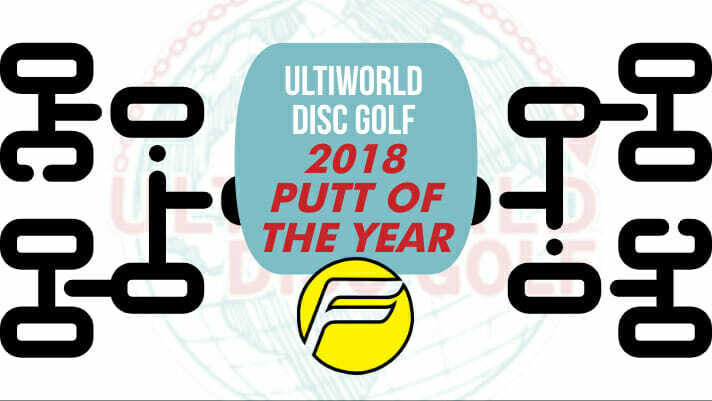 Ultiworld Disc Golf’s 2018 Putt of the Year voting is presented by Friction Gloves; all opinions are those of the author. Check out our review of Friction’s DG Gloves here. The 2018 professional season was one for the books, filled with shots causing us to pick our jaws up off the floor. And there were so many, we figured we’d enlist Ultiworld Disc Golf readers to help us decide on the season’s best. With that in mind, we are proud to present the second of four bracket challenges to close out the year. We’ve culled highlights from the sport’s best media providers and broken them down into four categories: Roller of the Year, Air Shot of the Year, Putt of the Year, and Ace of the Year. After each bracket is decided, the winners will battle in a four-way, College Football Playoff-style bracket that will determine the 2018 Shot of the Year. Pick your favorite entry for Putt of the Year from each matchup below, then come back next week for the next round. And if you’re having fun with this, feel free to share the love on social media. A special thanks to Jomez Productions, Central Coast Disc Golf, the Disc Golf Guy, and others for capturing these clips. And we’re off! Definitely one of the most memorable battles of the year was during the MPO final round at the MVP Open, and Paul McBeth turned in potentially the longest ever Slomez with his putt on hole 13 while chasing down the lead. We’re also required to include the 18-under clinching putt of McBeth’s at the Great Lakes Open. It was a tough putt to begin with, not even factoring in the looming milestone. Another highlight got more attention on this hole (we’ll see it in a second), but Paige Bjerkaas’ par save at the MVP Open was stellar. Madison Walker had her own heroic effort at the Idlewild Open with this big jumper on hole 13. A birdie from the long tee pad at Maple Hill is almost unheard of. Matt Dollar was one of only three for the weekend. After the round, Hailey King confirmed she could not see the basket on this putt at the United States Women’s Disc Golf Championship. He didn’t need to hit the putt, but Ricky Wysocki cans this outside Circle 2 attempt to wrap up a win at the Utah Open. No fear on this run of the treacherous final hole at Winthrop Gold from James Conrad. Had he not connected, he would have gone a long way. Three of four players on Cam Colglazier’s card hit outside the circle putts on this Ledgestone hole. Cam’s was the best. We could put together a whole post of Garrett Gurthie Sonic shots, but we’ll settle for just this birdie from the Texas State Championship. After an unfortunate tree hit on one of Fox Run Meadows’ easier holes, Matt Orum still got the birdie with a 100-footer across a valley at Pro Worlds. Let’s tick off the difficulty of this putt from Paige Pierce at Masters Cup: straddle, uphill, anny, elevated basket. Buckets. Simon Lizotte makes this putt from the drop zone at the Glass Blown Open very casually. We could also make an entire list of outside Circle 2 putts from Gregg Barsby. We’re pitting two late season efforts against each other. An important Pro Worlds putt in the final round and a rocket in Delaware. Pink Aviar, man. Comments on "2018 Putt of The Year Bracket"